Property development company Elica Sdn Bhd has presented Shukeri Abdul Wahed and his family with a new home as part of its efforts to give back to the community. The keys to the unit was handed to the family by Elica managing director Bobby Ting and Welfare, Women and Community Wellbeing Minister Datuk Fatimah Abdullah. For more than a decade, Shukeri and his family of seven lived in a makeshift house in Kampung Buntal. While the house had been gradually improved using recycled and new materials, the family applied for housing assistance many years back, and had been waiting since. “We have been waiting for housing aid for a very long time. We applied for it through e-Kasih and were surprised to receive a call last month that we are finally granted a home,” said Shukeri’s wife, Siti Khadijah Kawi. Made from an old shipping container, the unique KiKotak Home is designed to create a highly flexible, eco-friendly and affordable living space for a family of up to eight members. The concept is part of Elica’s effort to help improve the living conditions of underprivileged families within the state via responsible and environmental friendly design. In fact, the company plans to give out 10 more KitKotak homes in 2017, said Ting. Featuring a living area and a kitchen, the house also has a storage unit as well as a toilet and shower. The house’s angled roof is specifically designed to capture rainwater. Lit by natural light and simple low-energy lighting scheme, the home comes with an electric fan and adequate power points. Glazed window louvres and a continuous high-level slot near the end provides additional ventilation. 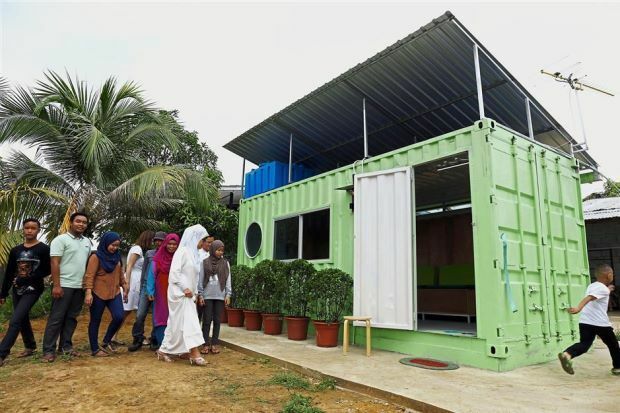 “This concept is a great idea that not only offers a solution to housing needs of the poor but also good from an environmental perspective, or else the abandoned container will be left as scrap metal,” said Fatimah. With this, she urged housing developers and corporations to help in providing a decent living space for underprivileged families as part of their corporate social responsibility programmes. She revealed that the government had received 23,928 applications under the e-Kasih programme for the poor and destitute households between 2011 and 2016. Of these, only 7,738 have been approved while the remaining 16,190 are still waiting for assistance.